Council communism (also councilism) is a current of socialist thought that emerged in the 1920s. Inspired by the November Revolution, councilism was characterized by its opposition to state capitalism/state socialism and its advocacy of workers' councils and soviet democracy as the basis for dismantling the class state. Strong in Germany and the Netherlands during the 1920s, council communism continues to exist today within the greater socialist and communist movements. Chief among the tenets of council communism is its opposition to the party vanguardism and democratic centralism of Leninist ideologies and its contention that democratic workers' councils arising in the factories and municipalities are the natural form of working class organization and authority. Council Communism also stands in contrast to social democracy through its formal rejection of both reformism and "parliamentarism" (i.e. the compromises and quids pro quo, such as logrolling, normally found in legislative politics). Council Communists maintain that the working class should not rely on Leninist vanguard parties or hope for reforms of the capitalist system to bring socialism. It is viewed that worker's revolution will not be led by a "revolutionary" political party since these parties will only later create a party dictatorship, many point to the Bolshevik party in the October Revolution as an example, claiming that the party only became the capitalist class that replaced the old aristocratic feudal class. Revolutionary political parties will only agitate for revolution and worker's councils. These worker's councils which form during periods of struggle are believed to be the natural organizations of the working class. Democratic worker's councils will coordinate the functions of a society rather than a bureaucracy found in state socialist societies. Because of these beliefs Council Communists have been compared to Anarchists and Syndicalists. As the Second International decayed at the beginning of World War I, socialists who opposed nationalism and supported proletarian internationalism regrouped. In Germany, two major communist trends emerged. First, the Spartacus League was created by the radical socialist Rosa Luxemburg. The second trend emerged among German rank-and-file trade unionists who opposed their unions and organized increasingly radical strikes towards the end of 1917 and the beginning of 1918. This second trend created the German Left Communist movement that would become the KAPD after the abortive German Revolution of 1918–19. As the Communist International inspired by the Bolshevik revolution in Russia formed, a Left Communist tendency developed in the Comintern's German, Dutch and Bulgarian sections. Key figures in this milieu were Anton Pannekoek, Otto Rühle and Herman Gorter. In the United Kingdom, Sylvia Pankhurst's group, the Communist Party (British Section of the Third International), also identified with the Left Communist tendency. Alongside these formal Left Communist tendencies, the Italian group led by Amadeo Bordiga is often commonly recognized as a Left Communist party, although both Bordiga and the Italian Communist Left disputed this and qualified their politics as separate, distinct and more in line with the Third International's positions than the politics of Left Communism. Bordiga himself did not advocate abstention from the unions, although later Italian Left currents developed a critique of the "regime unions", positing that most or all unions had become tools of capitalism by submitting themselves to bourgeois interests and were no longer viable organs of class struggle. Nevertheless, those "Bordigists" who put forward this critique still held out the necessity of "red unions" or "class unions" re-emerging, outside and against the regime unions, which would openly advocate class struggle and allow the participation of communist militants. These various assorted groups were all criticized by Vladimir Lenin in his booklet "Left-Wing" Communism: An Infantile Disorder. Despite a common general direction, and despite sharing the criticism of Lenin, there were few politics held in common between these movements. An example of this divergence is that the Italians supported the Right of Nations to Self Determination, while the Dutch and Germans rejected this policy (seeing it as a form of bourgeois nationalism). However, all of the Left Communist tendencies opposed what they called "Frontism". Frontism was a tactic endorsed by Lenin, where Communists sought tactical agreements with reformist (social democratic) parties in pursuit of a definite, usually defensive, goal. In addition to opposing "Frontism", the Dutch-German tendency, the Bulgarians and British also refused to participate in bourgeois elections, which they denounced as parliamentarism. In Germany, the Left Communists were expelled from the Communist Party of Germany, and they formed the Communist Workers Party (KAPD). Similar parties were formed in the Netherlands, Bulgaria and Britain. The KAPD rapidly lost most of its members and it eventually dissolved. However, some of its militants had been instrumental in organising factory-based unions like the AAUD and AAUD-E, the latter being opposed to separate party organisation (see: Syndicalism). The leading theoreticians of the KAPD had developed a new series of ideas based on their opposition to party organisation, and their conception of the Bolshevik revolution in Russia as having been a bourgeois revolution. Their leading figures were Anton Pannekoek, Herman Gorter and Otto Rühle. Rühle later left the KAPD, and was one of the founders of the AAUD-E. Another leading theoretician of Council Communism was Paul Mattick, who later emigrated to the US. A minor figure in the Council Communist movement in the Netherlands was Marinus van der Lubbe, who was accused of the burning of the Reichstag in 1933 and consequently executed by the nazis after a show trial that marked the beginning of the persecution of socialist and communists in Nazi Germany. The early councilists are followed later by the Group of Internationalist Communists, Henk Meijer, Cajo Brendel and Paul Mattick, Sr. There was a resurgence of councilist groups and ideas in the 1960s, through the Situationist International, Root and Branch in the United States, Socialisme ou Barbarie in France, and Solidarity in the UK. Alongside and sometimes connected to the councilists were the early Western Marxists, György Lukács (a council communist himself from 1918–21 or 22) and Karl Korsch (who turned to council communism in the 1930s). During the Russian Revolution of 1917, councils akin to those advocated by Council Communists were a significant political and organizational force; the Russian word "soviet" itself means council. After the success of the February Revolution, the Bolsheviks sought to capitalize on the influence of the soviets in order to boost their own popularity. Bolshevik leaders advocated the transference of authority to the soviets and the dissolution of Russian Provisional Government by means of a second revolution. When this campaign succeeded and the October Revolution occurred, the creation of the Congress of Soviets marked the beginning of a process of diminishing workers' control of the soviets, and the decisions of the Bolshevik Party acquired the full authority of the State. Thus, the new regime had developed into a one-party system, the Supreme Soviet (successor to the Congress of Soviets) had been relegated to the role of a rubber-stamp parliament, meeting just once a year to ratify decisions already made at higher levels, in most cases with no dissenting votes. Real power was concentrated in the hands of the Communist Party of the Soviet Union. ^ Pannekoek, Anton. State Capitalism and Dictatorship International Council Correspondence, Vol.III, No.1, January 1937. ^ Ruhle, Otto. "The Revolution Is Not A Party Affair". 1920. ^ "Council communism - an introduction". libcom.org. Retrieved 2016-11-05. ^ Jacoby, Russell (1991). "Western Marxism". In Bottomore, Tom; Harris, Laurence; Kiernan, V.G. ; Miliband, Ralph (eds.). The Dictionary of Marxist Thought (Second Revision ed.). Blackwell Publishers Ltd. p. 584. ISBN 978-0-631-16481-4. Herman Gorter, Sylvia Pankhurst, Otto Rühle, Non-Leninist Marxism: Writings on the Workers Councils. St Petersburg, Florida: Red and Black Publishers, 2007. ISBN 978-0-9791813-6-8. Bock, Hans-Manfred (1992). "Die Marx-Dietzgen-Synthese Pannekoeks und seines Kreises". In van der Linden, Marcel (ed.). Die Rezeption der Marxschen Theorie in den Niederlanden. Trier: Karl-Marx-Haus. Bourrinet, Philippe (2017). The Dutch and German communist left (1900-68): 'Neither Lenin nor Trotsky nor Stalin! ", "All workers must think for themselves!". Chicago: Haymarket. Bricianer, Serge (1978). Pannekoek and the Workers' Councils. St. Louis: Telos Press. Lenny Flank, 'Philosophy of Revolution: Towards a Non-Leninist Marxism'. St Petersburg, Florida: Red and Black Publishers, 2007. ISBN 978-0-9791813-8-2. Gerber, John (1988). "From Left Radicalism to Council Communism: Anton Pannekoek and German Revolutionary Marxism". Journal of Contemporary History. 23 (2): 169–189. Gerber, John (1989). Anton Pannekoek and the Socialism of Workers' Self-Emancipation, 1873-1960. Dordrecht: Kluwer. Harmsen, Ger (1986). "Le marxisme et la revue 'De Nieuwe Tijd'". Sepentrion. 15 (3): 57–62. Harmsen, Ger (1990). "Le communisme des Conseils ouvriers de Pannekoek et Gorter". Sepentrion. 19 (2): 47–51. Herrmann, Friedrich Georg (1972). "Otto Rühle als politischer Theoretiker". Internationale Wissenschaftliche Korrespondenz zur Geschichte der Arbeiterbewegung. 17: 16–60. Herrmann, Friedrich Georg (1972). "Otto Rühle als politischer Theoretiker". Internationale Wissenschaftliche Korrespondenz zur Geschichte der Arbeiterbewegung. 18: 23–50. Kalshoven, Frank (1992). "The Development Marxist Value-Theory in the Netherlands, 1900-1940". In van der Linden, Marcel (ed.). Die Rezeption der Marxschen Theorie in den Niederlanden. Trier: Karl-Marx-Haus. pp. 315–363. Memos, Christos (2012). "Anarchism and Council Communism: on the Russian Revolution". Anarchist Studies. 20 (2): 22–47. Mergner, Gottfried (1982). Schmeitzner, Mike (ed.). Die Gruppe Internationaler Kommunisten Hollands. Reinbeck bei Hamburg: Rowohlt. pp. 7–15. Mergner, Gottfried (1973). Arbeiterbewegung und Intelligenz. Starnberg: Raith. Mergner, Hans-Gottfried (1992). "Der Politiker als Dichter: Herman Gorter. Die Marxismusrezeption in der Dichtung Herman Gorters". In van der Linden, Marcel (ed.). Die Rezeption der Marxschen Theorie in den Niederlanden. Trier: Karl-Marx-Haus. pp. 124–149. Morrien, Joop (1984). "Marx and the Netherlands—The Dutch Marxist School". In Galanda, Brigitte (ed.). 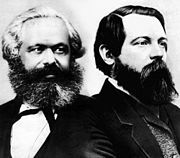 Marxismus und Geschichtswissenschaft: Linz, 6. bis 9. Jänner 1983. Vienna: Europaverlag. pp. 414–421. Pinta, Saku (2012). "Council Communist Perspectives on the Spanish Civil War and Revolution, 1936–1939". In Prichard, Alex; Kinna, Ruth; Pinta, Saku; Berry, David (eds.). Libertarian Socialism: Politics in Black and Red. Basingstoke: Palgrave Macmillan. Rachleff, Peter (1979). Marxism and Council Communism: The Foundation for Revolutionary Theory for Modern Society. New York: Revisionist Press. Roth, Gary (2015). Marxism in a Lost Century: A Biography of Paul Mattick. Leiden: Brill. Schmeitzner, Mike (2007). "Brauner und roter Faschismus? Otto Rühles rätekommunistische Totalitarismustheorie". In Schmeitzner, Mike (ed.). Totalitarismuskritik von links: deutsche Diskurse im 20. Jahrhundert. Göttingen: Vandenhoeck & Ruprecht. pp. 205–227. Shipway, Mark (1988). Anti-Parliamentary Communism: The Movement for Workers' Councils in Britain, 1917-45. Basingstoke: Macmillan. Siegfried, Detlef (2004). Das radikale Milieu: Kieler Novemberrevolution, Sozialwissenschaft und Linksradikalismus 1917–1922. Wiesaden: Springer Fachmedien. van der Linden, Marcel (2004). "On Council Communism". Historical Materialism. 12 (4): 27–50. van der Linden, Marcel (2007). Western Marxism and the Soviet Union: A Survey of Critical Theories and Debates since 1917. Leiden: Brill. Wright, Steven (1980). "Left Communism in Australia: J.A. Dawson and the 'Southern Advocate for Workers' Councils'". Thesis Eleven. 1 (1): 43–77. This page was last edited on 28 December 2018, at 11:40 (UTC).